On February 14, 1912, Maria Kalaw Katigbak, a Senator, beauty titlist, writer, and civic leader, was born in Manila to Teodoro M. Kalaw, journalist-scholar, and Pura Villanueva, pioneer civic leader and champion of women’s rights in the Philippines. Maria Kalaw Katigbak belonged to a well-known and much admired family. Her father was a public official whose reputation for integrity was unquestioned. Intellectually, he was at par with the country’s top political figures who were his friends. Her mother, a Spanish mestiza, was a sharp-thinking businesswoman. Practical but principled, she took great pains in protecting the family’s name. It was she who greatly shaped the mind of Maria. Unlike many offspring of famous and affluent families, Maria grew up unspoiled. Her mother accustomed her to a life of Spartan simplicity. Glamour and luxuries were things not to be identified with her. She matured away from the frivolous crowd, but knowing she was intellectually superior to them. Maria studied at the Jefferson Elementary School. She spent a year at St. Scholastica’s College for her class in religion, taking the tranvia everyday. She was a hard-working student, eager to learn. The many awards she won in school attested to her scholarship. She graduated as high-school valedictorian from Philippine Women’s University in 1928. 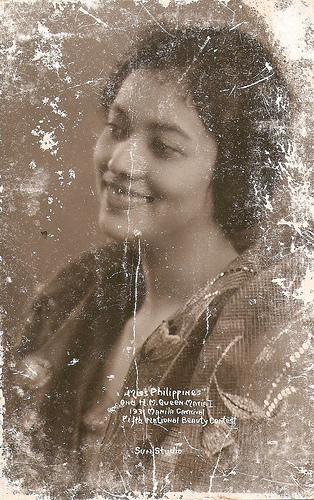 She then enrolled at the University of the Philippines, where she earned two degrees, Bachelor of Philosophy in 1932, and Master of Arts in Social Work. At the UP, she joined the staff of the Philippine Collegian, was secretary of the UP Student Council, president of the UP Women’s Club, secretary of the UP Debating Club, and member of the UP Writers Club. For her outstanding accomplishments, she received the Most Distinguished Senior Award upon graduation. Her essay comparing and contrasting the Batangueña and the Ilonga launched her writing career. She authored the biography of her mother, and conducted research on the history of Lipa, her father’s hometown, and of Batangas province. She later became editor of Dawn, an early women’s magazine. She took her master’s degree in literature at the University of Michigan, where she was sent as a Barbour scholar. Replicating her feat at the UP, she focused not only on her studies but in student activities as well, presiding over the Philippine-Michigan Club and serving as secretary of the Cosmopolitan Club for Foreign Students. Her sister Pura stayed with her in the United States. She later attended the University of Santo Tomas, where she received her bachelor’s degree in literature as well as her doctorate in philosophy. Like her mother who was the epitome of beauty and brains, she also reigned as "Queen of the Manila Carnival", for the year 1931-32. Life after college saw her teaching English both at the University of the Philippines and the Philippine Women’s University. She also honed her business skills by dabbling in real estate. After she got married and became a mother herself, she knew what it was to be beset with the problems of running a household, supervising the children, helping manage the family enterprises, and finding the time to read. Once her children were grown up and her motherly duties over, she decided to enter public service. The national elections of 1961 made her the lone woman member of the Philippine Senate from 1961 to 1963. As a senator, Maria Kalaw-Katigbak is credited with the revival of the school calendar, which is now in place. That calendar had been changed in 1964 by then Secretary of Education Alejandro Roces, who wanted the opening of classes on all levels moved earlier so as to include the summer months in the school year. Secretary Roces reasoned that excluding the months during which typhoons usually hit the country would ensure having more school days for learning and is safer for students. However, his initiative proved to be unpopular. In response to the public clamor, Senator Katigbak authored Senate Bill 652 in order to restore the old school calendar, arguing that the hot, summer months were, in fact, conducive to sleepiness and, therefore, a setback to learning. Senator Katigbak also authored the Consumer Protection Act, or Republic Act No. 3765, which enabled consumers to buy goods on installments and made similar forms of transaction by credit. Other Senate measures she authored were those regulating financing companies; creating the National Commission on Culture, and establishing the Philippine Executive Academy as an affiliate of the University of the Philippines. She was active in other fields. She was president of the Girl Scouts of the Philippines, the Municipal Symphony Orchestra, and the Philippine Women Writers’ Association, which she had organized in 1938. She was a member of the national board of the Catholic Women’s League, the UP Board of Regents, the Board of National Education, and the Board of State Colleges. She organized and was the first executive director of the Catholic Charities of Manila. At UST, she headed the Graduate School of Social Work, apart from being an associate professor. She was a professor of English not just at the UP but also at the PWU. She was a writer and columnist of the Manila Times and the Weekly Nation, and was chairman of the Writers Union of the Philippines. Like her father Teodoro who served in 1922, she sat as member of the UP Board of Regents from 1962-1964. She also headed the Movies and Television Review and Classification Board (MTRCB), whose precursor, the Philippine Board of Censorship for Motion Pictures, created around 1929, was headed first by her father. Her diverse concerns took her to a number of international fora, chiefly as Philippine delegate, notably the Afro-Asian Conference of Girl Scouts in Athens; the Second Congress of the Lay Apostolate in Rome; and the 21st UNESCO General Conference in Paris, over which she presided as chairman. Senator Katigbak was also some kind of amateur agronomist. In Lipa, she had three farms planted to black pepper, corn, ipil-ipil, and coffee. She was known for regaling her friends with the virtues of brewed Batangas coffee. Senator Katigbak was married to Dr. Jose R. Katigbak, obstetrician and gynecologist, by whom she had four children. Ancheta, Herminia M. and Beltran-Gonzales, Michaela. Filipino Women in Nation Building. Q.C. : Phoenix Publishing Hose, Inc., 1984. Gwekoh, Sol H. Distinguished 100. Manila: The Author & APO Book Company, 1939. Tiongson, Nicanor G. CCP Encyclopedia of the Arts. Volume 9. Manila: Sentrong Pangkultura ng Pilipinas, 1994.